I am a strong believer that books are a great way to become literate in any language! 1) Japanese Language School Book Sales – First, find out if there is a school in your area. I would just google “Japanese Language School (Your City)”. – Then contact someone to see if they are having a sale or “Bazaar” anytime during the year. 2) Find a Japanese Person and Ask for Suggestions – They will probably be a wealth of information as far as Japanese resources in your area. They may know people who are moving back to Japan (moving sales are great places to buy books!) or may be willing to sell you/or let you borrow some of their books. Or perhaps there are Japanese Clubs in your area. High School/College teachers who teach Japanese may also be a great resource. 3) If you have a friend or relative in Japan, ask them to send you books. This is a great option if the book you want is not available anywhere in the U.S. BUT be aware that shipping will probably cost as much as the book! 4) Check your local libraries. Once in awhile, I spot books written in Japanese at the library. If you live in California, Washington, Hawaii, New York City or Illinois (where there are large Japanese populations), you may have better luck. If your local library doesn’t carry Japanese books, maybe you could ask them to! 6) Surprisingly, Amazon.com had a modest selection…Click HERE so see my suggestions. If I had all the money in the world, I would hop on the plane to Japan and come home with a suitcase full of books 🙂 Do YOU have any other tips? Please share! Yeah, knowing Japanese people is definitely the best way to get Japanese stuff. They’re usually super generous too. We are friends not because of the Japanese stuff only, right?? I completely understand what you want to say, and agree with that. You might have chance to ask moving sale or share the books. But you need to chose the word. Especially, Kodomonotomo series are good price. Oh no! That is absolutely not why I am your friend, or friends with any of my Japanese friends!! (I could list a 100 reasons why I like you :))You’re right, I should change the wording so it doesn’t sounds that way- thanks for your honest opinion. And thanks for your suggestions. That is so kind of you! I might actually be in DC soon for business, but it’s a bit tentative. Hi — Thanks for this list. I have a question, though. In the descriptions of the books in your list, there is no indication of whether the book is in all English, English plus hiragana, or English plus kanji. We can’t read kanji — my kids and I are learning hiragana. But it looks, for example, like the CDs you link to are in English. Can you point me to a hiragana-only list, or just a recommendation of a few books? Thanks! I’ve done pretty well with Japanese books on ebay, since I’m not looking for specific books I check and see if people are selling books in lots, rather than just single books. The Cleveland Public Library has a small selection of Japanese language children’s books at the main branch location, maybe 5 shelves full? I don’t get to Columbus often, but I love Hana Gifts, particularly their used book section. I’ve bought some great books there. Sometimes library sales will get donations, I found a lovely copy of Tasha Tudor’s Christmas Book in Japanese last year at a local library sale–for fifty cents! I also like Yesasia.com. I believe they based in Hong Kong and offer free shipping for orders over 39.00. The books are more expensive than on Amazon.jp but the free shipping makes up for it, I feel. Suki- are you talking about the books on Amazon.jp? If that is the case, you can probably assume most of the children’s books are written in hiragana, or at least have furigana (hiragana over the kanji). If you are referring to my list of books here: https://hiraganamama.wordpress.com/2011/01/07/my-favorite-books/ , they are all great for learning hiragana- they are all written in Japanese. I have a few more book reviews coming up, you might be interested in those. If that doesn’t answer your question, maybe you could point me to what books you are specifically wondering about and I can tell you if they are written in Japanese or English. Hi — I’m not using amazon.jp because my Japanese is rudimentary (speaking positively of my accomplishments!). I was looking at your STORE list and I see a bunch of books, some of which I know are all in English such as Japanese Favorite Stories. I would really, really love bilingual books with hiragana, but would settle for very easy all-hiragana books on the level of an easy reader. Given how long it’s taking me to shove hiragana into my head, I’m not expecting to tackle Kanji anytime soon! Thanks. Hi Suki, I don’t have the time right now to go through all the books in the store but it’s pretty easy to tell by just looking at the cover… if the cover is in hiragana, the book will be in hiragana. I will try to do a post about which books might be good for people like you(who only know hiragana) soon. Hello, I found your post because I was searching for a place to sell my extensive collection of Japanese children’s books and books for adults learning Japanese. Do you have any recommendations for that? I got a lot of them off of eBay — and that’s the only place I can think of to sell unless you know of somewhere else. Thanks! eBay is probably your best bet if you want to reach a wide audience! You could try places like Craigslist but I’m not sure how successful that would be. You could also contact local Japanese teachers, Japanese clubs, Manga clubs, etc. Good luck. Extensive collection of Japanese children’s books? Wow! I’d like to buy them!! Try selling them on furuhon.us . You sell directly to buyer, no fee. I’ve experienced no trouble, as Japanese people are normally good at paying and shipping on time. Usually payment is done by personal check or paypal on receipt of the books. If you want to sell bulk, you could ad comment that you’ll give discount on bulk buy. I just started reading your blog. Thank you for the useful information! http://www.kinokuniya.com (Bookweb USA) has the most selection and free shipping over $100. The site is in Japanese. My Partner and I putting out an electronic children’s book (ages 2-4) which will be in Japanese/English with Japanese translation and narration. I read your article and we may be overlooking a niche market!!! People interested in reading Japanese!!! We shall be publishing on itunes but does anyone have android sites where they download Japanese books from? The International Children’s Digital Library has 13 Japanese titles that can be viewed online. Some of them are from the 1940’s and have very sweet illustrations! I have a Japanese picture you would love. “Edwina Beena’s Polka Dot Day,” is in English, Spanish and Japanese. I live in the US and print the Japanese edition myself, wrap it in polka dot paper and include a cello bag with stickers, cards and a small magnifying glass. The book is a great gift that can be sent direct form me, the author. The artist is Japanese. Please look at the book on my website and contact me. For people in Washington or Oregon, the Uwajimaya stores have amazing bookstores with a huge selection of books in Japanese and magazines! Thanks for posting this blog. I am really interested in finding Japanese Children’s audio books that also have the book along side of it. Any suggestions as to where I might be able to track it down? I’m not sure right off the top of my head! We have just published a Japanese English children’s book on Amazon! Check it out. Hideki and Kenji Save the Day by Bonnie West and Diane Carter for ages 4-8 or anyone learning Japanese. ! Good Morning Mam Iam interested read japanees language what am i do, kindly give suggestion. Thanking you, Malleswara rao, gudivada -521301. Andhra pradesh. india. I also have print copies available if anyone is interested. 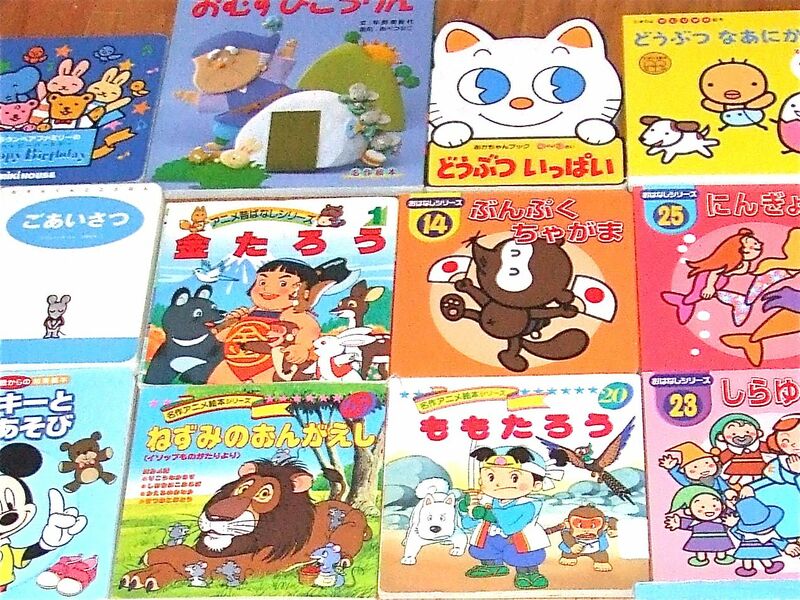 Hi, I know I’m very late to the conversation, but I found this site because I’m desperately trying to get rid of about 40 Japanese children’s books (some are vintage). I tried donating them or giving them away on Craig’s List, but there aren’t any takers. As a Japanese person, I can’t throw them away because of the belief that books contain spirits. Don’t want to mess with my karma 🙂 Do you know of a place I can donate them too? Any of your readers want them? We would love to have them. We are in Fort Lee, NJ, very close to NYC. Are you close by? Hi Barry, we are fairly close by (D.C.). Perhaps Ms. Hiraganamama would kindly connect us so that we can exchange addresses. I am willing to ship or drop it off when I visit my friend in NY. Oh my! I would love these! How do I get in touch with you? You can email me at respicsj (at) me (dot) com.